Theodoros Karyotis’ essay “The Right to the City in an Age of Austerity”, focusing on greek urban-political struggles in the period of 2008 and after, allows us to conceive of what a radical politics might look like beyond the indigenous-capitalist fracture exemplified in territoriality and ethnically based social movements (Chiapas, Rojava, Kabylia, etc.). 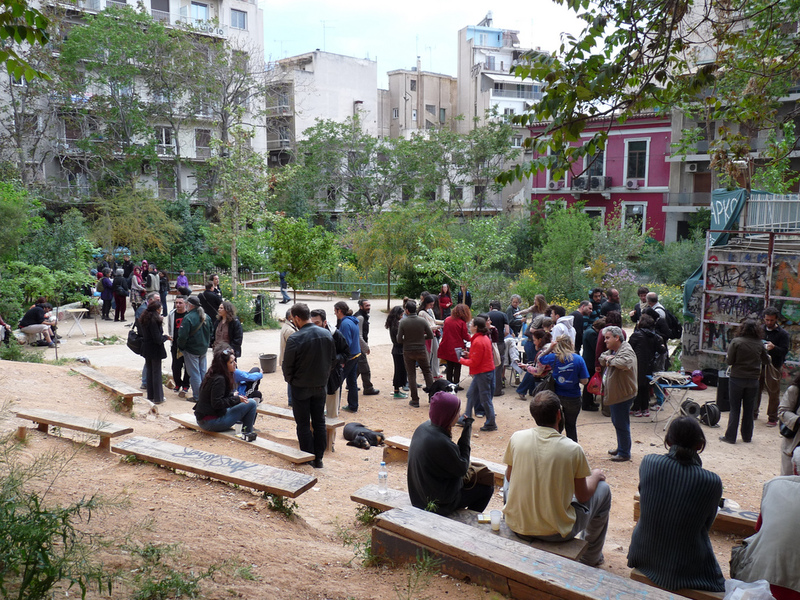 With attention to greece, but with broader implications, the radical social movements which have marked the country may be characterised as efforts to create and “re-ground” social relations in increasingly privatised and fragmented spaces. The many anonymous of the December 2008 revolt and of the “occupy” movement of 2011 have given birth to a plethora of experiments in social constitution outside traditional political forms and generic capitalist relations. And the experiments have resonated beyond any strictly defined militant or activist base, filtering into peoples everday as they try to piece together forms of life in the midst of permanent crisis. The question of the sustainability, and not just political, of these many expressions of self-managed autonomy is real. (Here, perhaps, the absence of the “land” rears its head again) However, we have serious reservations about the municipalist direction that Karyotis’ seems to want to impress upon the movements (following on the spanish example). It would seem that another path remains, and one which is largely unexplored today in urban spaces, namely, the federation of city based collectives that share at least the common ideal of autonomy (always to be redefined in the process) and who could work together for the creation of larger and more intense forms of cooperation, what one can call, using a different language, “institutions of commoning”. With this said, we share Karyotis’ essay (originally published with roarmag and also posted on autonomias.net). We also post, in succession, a video recording of a lecture by Stavros Stavrides at the conference “The Right to the (New) City: Art, New Towns and The Commons”, held at the MK Gallery in London, in the summer of 2016. Stravides intervention continues his reflection on and theorisation of commoning in urban spaces, from the political starting point of the collapse of the State and the social-ethical starting point of the commons as a way of life (rather than a thing, or object, or relationship to property). As we are presently witnessing throughout the Global North, perceived threats to a society’s stability may activate reactionary and xenophobic reflexes. Through carrot-and-stick tactics, Golden Dawn took advantage of the collapse of the two-party system that had predominated since the 1974 transition to democracy. On the one hand, it cultivated a “Robin Hood” image by organizing food hand-outs and blood donations “for Greeks only” — a perverted and exclusionary kind of “commoning.” On the other hand, it began a reign of terror, with neo-Nazi death squads patrolling the streets in many neighborhoods and attacking anyone looking “undesirable” — anyone looking like an immigrant, a homosexual, a transsexual, a radical and so on — with the blessing or the direct participation of the police. The xenophobic campaign lasted several years, and it left hundreds of victims. It was only after the murder of anti-fascist rapper Pavlos Fyssas and the subsequent intensification of decentralized antifa tactics by social movements that the streets could be reclaimed. Under popular pressure, the state decided to “put a leash” on its erstwhile allies. This entry was posted in Commentary and tagged autonomy, Communism, greece, occupy the city, revolution, Stavros Stavrides, Theodoros Karyotis. Bookmark the permalink. I would just like to mention that I am not a convinced advocate of municipalist politics, and neither, of course, am I opposed to it on ideological grounds. Rather, I have a cautious but pragmatic stance towards it. I have commented elsewhere on the numerous problems and limitations faced by municipalists in Spain: the rise of a new political elite separated from base processes, the predominance of a “governmentalism” that sees institutions as neutral, the countless contradictions in the policies followed, etc. However, I admire the fact that this is a movement that is self-aware, that tries to address its contradictions and not rationalise or justify them, a movement that is producing constantly self-criticism. In the case of Greece, what I criticise in my article is not the failure to create a municipalist movement, but the complete disregard for the need to coordinate, scale up and overcome our small political space. After the movement “boom” of 2010-2013, self-managed collectives at large remained isolated and political groups became even more entrenched in their hardline ideologies. The result of this failure to articulate a coherent and diverse counter-power was the erosion of the movements by Syriza, as this party had no “competition” in trying to pose as the expression of anti-austerity struggles. As we all know, the consequences were disastrous. Julius, I second your proposal for “the federation of city based collectives that share the common ideal of autonomy and could work together for the creation of larger and more intense forms of cooperation”. In practice, there are many learned and established practices and processes that the left and libertarian movements would have to overcome and abandon before this federation is possible. This opens great debates regarding communication, identities, territoriality and power. I would be very happy if this debate started now, ahead of the next cycle of mobilisation. I in fact did not take your position as an ideological one and I can understand the interest in, even temptation of, some form of radical municipalism. To simply dismiss it out of hand would be absurd. However, as you state, the Spanish example is not in fact inspiring and it is not clear what different shape an institutional counter-power might take. The difficulty may lie in the very idea of having to think through or create a counter-power, for any counter-power seems condemned to bear the marks of what it is against. If so, then the alternative may lie rather in the creation of differing, anti-capitalist social relations outside of any specific dictated means or ends, especially pre-existing models of thought and action; that is, the exercise must inevitably be piecemeal and open, with the means-ends logic collapsing into a permanent process of self-creation. If this sounds vague, and it does, it is because there is no blueprint for this. If we need to think through the process – and I agree we must – the process must also be at the same time enacted, without pre-given forms or ends.